Attractive entry doors are an important part of enhancing your home’s curb appeal. Moyes Glass offers a wide variety of low-maintenance entry doors, available with or without decorative glass. Residential entry doors are available in a variety of rectangular and arched shapes and styles. Contact our office or visit our showroom to learn more about our entry doors. Residential entry doors are one of the most commonly used doors in the home. With the right door, you can drastically improve the aesthetic look and feel of your home. A new door can improve the energy efficiency of the home while always enhancing the home’s beauty. At Moyes Glass, we provide complete home door solutions. If you have a front door in need of replacement or other doors such as a garage door, basement door, and others, we are here to help! Our expert team provides a touch of personality to our doors no matter where they are installed. We have partnered with several name brand services to provide a large variety of styles, sizes, and use for our customers’ needs. Doors can be enhanced by adding decorative glass, stains, colors, and more. For entry door costs, please visit our Ogden showroom to view the large variety of styles we have available. 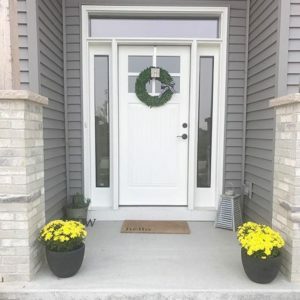 If you are seeking custom front door solutions, call our office to set up a time to meet with one of our experts to discuss your ideas and how we can make them into a reality. At Moyes Glass, we are your partner and we work with you every step of the way to ensure your home looks and feels the way you want it to with new custom doors and windows.